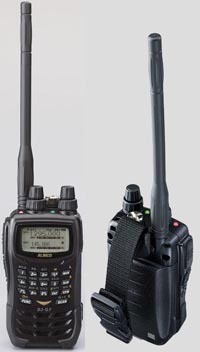 The IPX7 designation provides for limited waterproofing of the radio. The specifications are immersion in one meter (approx 3ft) of still sweet water for up to 30 minutes. 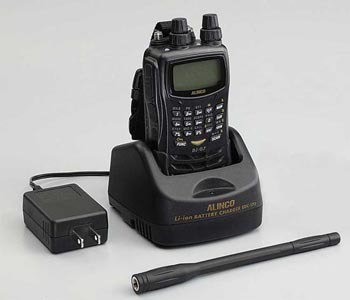 This compatibility is factory guaranteed for a period of one year provided all the jack covers are securely in place, any accessories connected must be genuine Alinco water-proof accessories and the radio has not been disassembled by the customer. The factory has tested and made the equipment compatible to IPX7 certification during engineering. However, please understand that this equipment is NOT certified IPX7 compliant but is designed to remain operational when used in rain, severe weather or in accidental cases of dropping it in water when used in extreme conditions and is in no way stating that you should attempt use the radio under water or submerge the radio for cleaning. Warranty will not cover radios that are water / salt damage due to negligence or misuse of the product. Specifications subject to change without notice or obligation. Specifications apply to Amateur Radio bands only. Permits required for MARS use. Product intended for use by properly licensed operators. Wide band receive related specification is for T-version only.800MHz cell-phones frequencies blocked on T version. RoHS compliant. Questo articolo sarà disponibile il Saturday 31 August, 2019.